DUBLIN, Ireland--(BUSINESS WIRE)--Feb. 27, 2014-- Covidien plc (NYSE: COV) today announced that it has closed its acquisition of Given Imaging Ltd., providing the company additional scale and scope to serve a significant medical specialty, the multibillion dollar global gastrointestinal (GI) market. Under terms of the merger agreement, Covidien has acquired all outstanding Given shares for $30 per share or an aggregate consideration of approximately $860 million, net of cash and short-term investments acquired. With this acquisition, Covidien now has one of the broadest portfolios for visualizing, monitoring and detecting abnormalities in the digestive system. 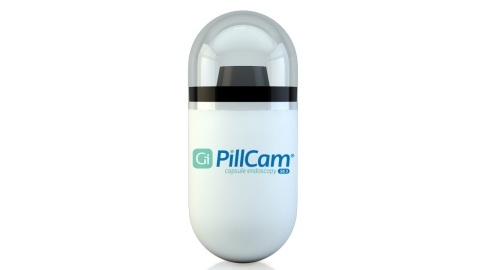 A key technology in the Given portfolio is the worldwide market leading product PillCam®, a minimally-invasive, swallowed optical endoscopy technology for the small bowel, esophagus and colon that does not require sedation of the patient. Covidien will report the Given Imaging business within the Advanced Surgical revenue reporting line. Given Imaging is expected to add between $40 and $50 million per quarter in incremental revenue. On a reported U.S. GAAP basis, the transaction is expected to be dilutive to earnings per share (EPS) in fiscal 2014. On an adjusted basis, excluding one-time items and transaction costs, management expects the transaction to be neutral to EPS in fiscal 2014. The transaction is expected to be accretive to EPS both on a U.S. GAAP and on an adjusted basis in fiscal 2015 and beyond. While the company has not completed its initial purchase price allocation and the final amount could differ significantly, it estimates incremental intangible asset amortization from the transaction to be approximately $35 to $45 million on an annual basis. From a “cash earnings” standpoint, which excludes the impact of amortization, the transaction is expected to be accretive immediately. Covidien management is not changing any of its guidance as a result of this transaction. Covidien is a leading global healthcare products company that creates innovative medical solutions for better patient outcomes and delivers value through clinical leadership and excellence. Covidien develops, manufactures and sells a diverse range of industry-leading medical device and supply products. With 2013 revenue of $10.2 billion, Covidien has more than 38,000 employees worldwide in more than 70 countries, and its products are sold in over 150 countries. Please visit www.covidien.com to learn more about our business. Any statements contained in this communication that do not describe historical facts may constitute forward-looking statements as that term is defined in the Private Securities Litigation Reform Act of 1995. Any forward-looking statements contained herein are based on our management’s current beliefs and expectations, but are subject to a number of risks, uncertainties and changes in circumstances, which may cause actual results or company actions to differ materially from what is expressed or implied by these statements. The factors that could cause actual future results to differ materially from current expectations include, but are not limited to, the ability to successfully integrate Given’s operations with Covidien’s and the time and resources required to do so; our ability to effectively introduce and market new products, keep pace with advances in technology and compete effectively; implementation of healthcare reform in the United States and globally; cost-containment efforts of customers, purchasing groups, third-party payors and governmental organizations; rising commodity costs; risk of cyber-attacks; intellectual property rights disputes; complex and costly regulation, including healthcare fraud and abuse regulations and the Foreign Corrupt Practices Act; recalls or safety alerts and negative publicity relating to Covidien or its products; product liability losses and other litigation liability; manufacturing or supply chain problems or disruptions; divestitures of some of our businesses or product lines; our ability to execute strategic acquisitions of, investments in or alliances with other companies and businesses; risks associated with doing business outside of the United States; foreign currency exchange rates; environmental liabilities; and tax legislation and potential tax liabilities. These and other factors are identified and described in more detail in our Annual Report on Form 10-K for the fiscal year ended September 27, 2013, and in subsequent filings with the SEC. We disclaim any obligation to update these forward-looking statements other than as required by law.